This time of year, when the veil between the worlds is thin, divination is a common practice. One of the easiest ways to find answers is with a pendulum. Traditionally, pendulums are used to respond to questions with a yes or no answer. Until you are completely comfortable with a pendulum, I learned to begin by asking it, “Show me yes.” The swing it gives – typically forward and back – is what your yes will look like. You can do the same for no – which traditionally is a swing from side to side. A friend of mine said her pendulum swings widdershins for no and deosil for yes, and was told that is quite common. If the answer is something other than yes or no, a pendulum might just hang straight, wiggle a little, or swing in a circle. Mine began doing that one day, and I came to understand it as meaning that the answer is not known or the situation is unclear. Sometimes it’s the question that is not phrased correctly, but other times, it can be that my energy is getting in the way – something that happens if I am not still and calm when asking the question. Take today, for instance. My anxiety was mounting as I frantically looked for my keys. With my pendulum held above the trunk of the car, I asked the question, “Are my keys in the trunk?” The answer came back as a circle. The same response came when I held it in the commercial trash container where the occupants of two buildings dispose of their garbage. I put away the pendulum. Had I been able to work further, I could have used it to provide more information. The photo is of an answer board. The surface was made by sanding off an old painting of a cabin in the woods. The spider is one of my totems, so I am drawn to the image of a web and used that to pull together the possible answers. 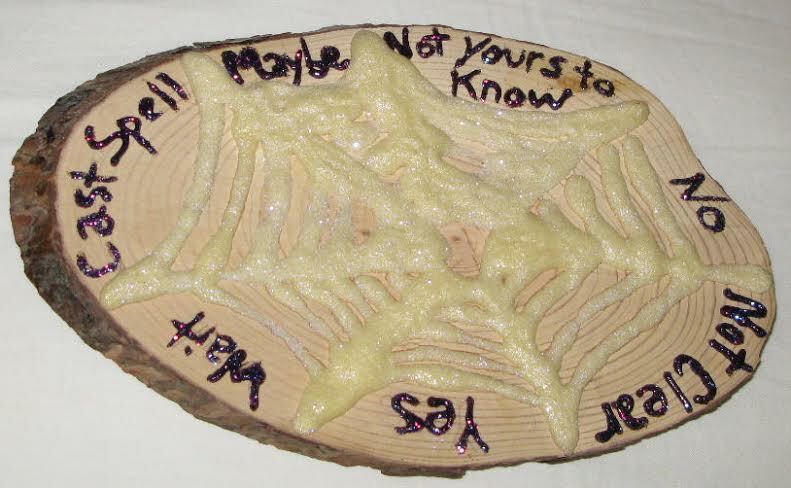 I used a little bottle glue with a fine point to draw on the web that I then sprinkled with glow-in-the-dark glitter. The glue, even with its fine tip, produced a line I thought was much too thick, so you may want to find another way. Glitter paint, also in a small plastic bottle with a thin tip, was used to print the letters. My design offers a variety of answers in addition to yes, no and maybe: wait, cast a spell, not clear and something I have come to understand as I am not meant to know the information. This works if the pendulum adjusts its swing to start in the center and move toward the answer. I have seen other pendulum charts that have “yes” at the top and bottom, “no” on the right and left, “maybe” in the upper right and lower left, and “don’t know” on the upper left and lower right. That way, the pendulum will point to the same answer and at either end of its swing. When it comes to a pendulum, almost anything can work. When I don’t have access to my pointed moonstone one, I will slip off my long necklace with several pendents on it and use that. I have also used a shorter necklace by holding one end and letting the pendent resting against the clasp act as the bobber. You can experiment with a key on a ribbon, a button on a string or a variety of other objects to find what works best and what will do in a pinch. I hope you’ll share your pendulum stories below. You know how it is, you’re scanning the web looking for the latest in scary or bizarre happenings, and then something catches your interest next thing you know you find yourself in a spiral of stories and theories. However, there comes the rare occasion when several stories match exactly or are eerily similar. This is a rare occurrence in the paranormal community so when it does happen you can sense the universal excitement in the air. I came across this the other night. I can’t even remember how I got there but soon I was reading, stories upon stories of an entity that refers to itself as “Zozo” and usually presents itself during Ouija board sessions. The fascinating thing with these stories are the similarities, people of different ages, from different parts of the country and even some other parts of the world have had experiences with this entity and the entities associated with him/her. Most research points to contact with this entity being reported through Ouija board sessions for at least 30 years. The theories of who Zozo actually is go back much further to the early 1800s. Usually the reports start out the same, a few friends, having a good time, “playing” with the board just to see what if anything will happen. If Zozo isn’t the first to come through an entity called Lilly will start communication. Lilly is reported as being nice and sometimes even warning the participant about Zozo. She has said Zozo is her evil sister. There are theories that Zozo and Lilly are the same entity and this is just a game it likes to play. When Zozo does come forth there are some differences to how the session will go. Some say it will humor the participant by answering questions but this soon gets frightening when it reveals very personal information no one else should know. Another common report is the entity will come through as very angry, threatening and violent, often manipulating the board or the planchette by making it hot to the touch or launching it away from the participants. This seems to happen most often if the person comes through as a skeptic or is being purposefully disrespectful. Zozo is known to control the board, often saying frightening things like promises of death. Another common report is of an entity called Mama, again there are theories this is all the same entity. Mama will appear usually during a session, the planchette will just move to M A M A over and over again. This is believed to be a tactic used by Zozo to confuse and weaken the mental defenses to move on to even more sinister intentions. The creepy thing on top of the fact that so many people have made contact with the same entity is that the contact, once initiated, doesn’t stop at the board. People who have had talked with Zozo have reported very terrifying occurrences days, even weeks later. Vivid dreams, catatonic states, accidents even deaths have been reported and not just by the person who used the board but to their families as well. This phenomenon has caught the attention of many people in the paranormal community including demonologists. Is this a demon? Many have called it such, however usually a demon will not give its name so readily, though there have been theories that Zozo is not really a single name but a name for the group of entities that accompany what seems to be the leader. Some have called Zozo more of an ancient Deity instead. Many have tried to find the source of the name saying it is another name for the demon Pazuzu, that it is a rough translation from the ancient Basque language meaning Crow or blackbird, even suggestions this is the 3 headed dog that guards the gates of Hell. A movie has been made about the encounters and there have been accusations that this is all just a wild publicity stunt to gain popularity on the project. Pending upon the part of the world or religion involved the theories of the identity of Zozo are seemingly endless. Yet each day more and more stories are told of encounters and experiences with this entity and they are all similar in one way or another. I have never been a fan of the Ouija board for this reason. You never know what kind of door you’re going to open or who or what is going to come through. 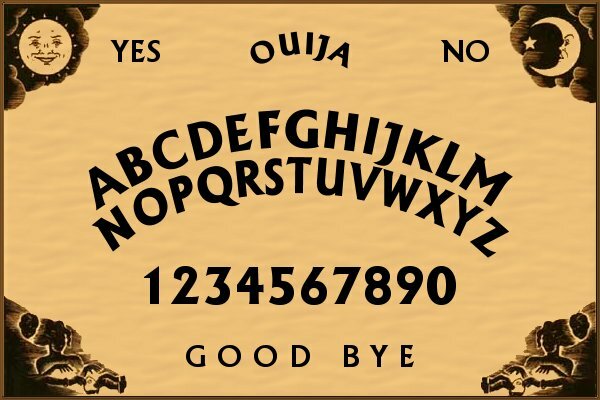 I know there are supposed rules to follow or Ouija etiquette if you will, but in my opinion regardless of if you opened and closed the session properly, if something is strong enough to come in, the less likely it will want to leave and the greater amount of danger you and your loved ones could be in for a long while.